One skill my children are still working on is "cutting something out." They have the open/shut movement of the scissors, but following or staying close to a line to cut a figure out, is still taking time. So I get this brainstorm. 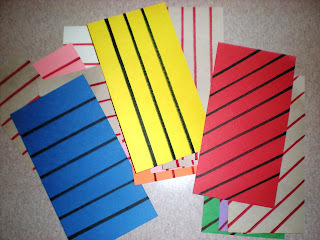 I will take home some scrap paper and draw vertical, horizontal, and diagonal lines on them. Then during free play I will have one of the tables as a cutting table. Sounds good--great practice. Well, I guess it was good in theory. 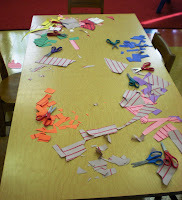 My choppers loved the cutting table, but I had lots of confetti when they were done:). Guess I'll just keep trying, it will happen. I just love your website and refer to it a lot to give me ideas. I am about to start teaching again in a supply capacity and here in Dubai children are starting school at 3!!!!! So I will refer to your site even more to give me ideas. Hi Trish, I added this to our C activities post tomorrow. Do you not do letters in your preschool?